Deya Dova is an Australian singer and producer who works closely with her husband, Hamilton Barnett, to create some of the most mystical, euphoric electronic music tracks today. Their eclectic blend of synths and sounds has struck a unique chord with many fans, who are unable to find that mix of mythology, music, and hopeful messages in any other artist. In the last four years alone, Deya Dova has recorded more than 50 tracks, travelling to places like the Sonoran Desert, Rocky Mountains, and Tikal Temple to collect natural sounds, channelling the energy of her surroundings into her work. 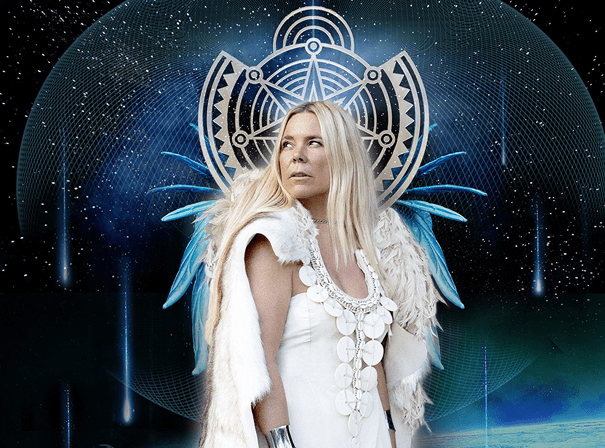 The singer has now completed four international tours, appeared in shows in countries like Indonesia and Costa Rica, and played festivals such as Luminate, Symbiosis, Wanderlust, Sonic Bloom, Bali Spirit, and Earth Frequency. Deya Dova’s live shows are as big of a draw for her audiences as her recorded output, featuring elaborate headwear, costumes, and choreography that make for rich visual imagery. She often collaborates with talented international dancers and performers to bring her live displays together, and audiences are never left disappointed. Two decades after the release of her first album, So Bravely Human, Deya Dova remains a refreshingly forward-thinking artist.